I have to start by saying that I am sorry my face really is not in any of these pictures. But we took these right after it rained and it was really really windy. So my hair seriously was out of control. I love it when I spend 30 minutes fixing my hair only to walk outside into a wind storm and it is ruined in 5 seconds! The curls pretty much were all gone an it was just a big frizzy mess! But I still tried to make it work. Anyway, on to my outfit. A sweater, scarf and over the knee boots is pretty much my uniform lately. I love the color of this sweater. I really have been wearing a ton of this color. And I love this chunky scarf. It is on sale for $20 so I also got it in black. It is such a great quality for $20. These over the knee boots are a really good dupe if the Stuart Weitzman boots. I love that these toe at the back so they really stay up. And they are really comfortable. I love this adorable pink sweater. Your boots are so cute too! I have the same boots! Aren't they the absolute best? Love this neutral outfit on you. I love your shoes so much! <3 Super cute and perfect with this outfit. 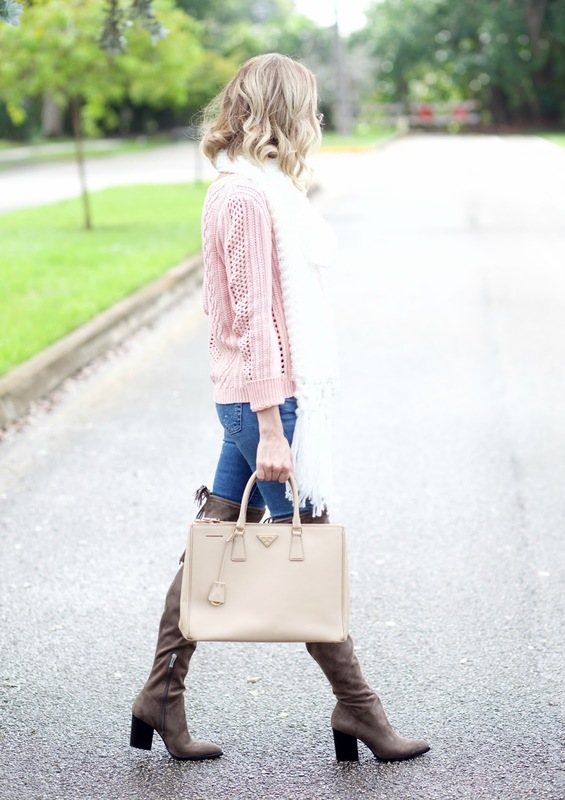 Love this pink sweater! Thank you for sharing the outfit!